0.3% of the earths surface is what is required to harvest the energy needed for all of humanity’s electrical and auto transportation needs. That is for 10 billion living with the same energy intensity as in the US. 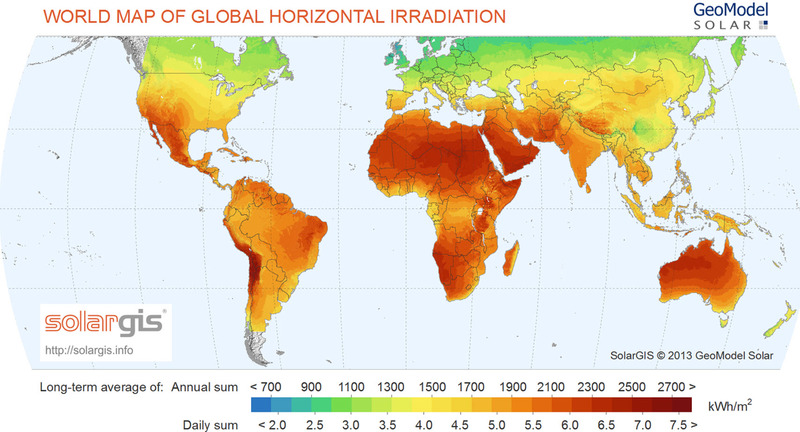 In the links below are shown calculations for the land needed if the world were going to use 100% solar energy for electricity and for electric cars. The total land required is less than 0.3%. That is roughly the size of Arizona. It is about 1/20th the size of the Sahara Desert. That sounds huge initially but to put it in perspective, the area of the US covered by roads and parking lots is 61,000 square miles which is about 1/4 of the area required. There is also a lot of rooftop space available. Since wind will also likely be used and there is a lot of wind power available, it is likely that about 1/4 would be powered by solar and that could be primarily on existing built space such as roofs parking lots and possibly roads and bridges. This calculation is for all electricity for 10 billion people having the same energy intensity as in the US. It also assumes that everyone drives as far as US drivers and uses electric vehicles. This accounts for about 2/3 of and industrialized world’s energy use. Non electrical loads such as oil refining and chemical processes and heating buildings can benefit significantly by known efficiency measures. This is calculated on an energy basis an assumes that there is a way to store the electricity generated during the day for night time use. It is a sanity check. If there wasn’t enough land then we wouldn’t need to talk about energy storage. But the numbers show that there is plenty of land. Windpower is a symbiotic user of land area . This post illustrates vividly the difference between wind and coal power. This report by NREL details the amount of land required by various solar technologies. PV Capacity Growth Here . PV Cost declines Here . This entry was posted in Path to a New Paradigm and tagged EV, Photovoltaics, PV, Renewable Energy, Solar Energy, Solar Paradigm. Bookmark the permalink. 2 Responses to What Percentage of the Worlds Land Area Would Be Required to Run Everything With Solar?